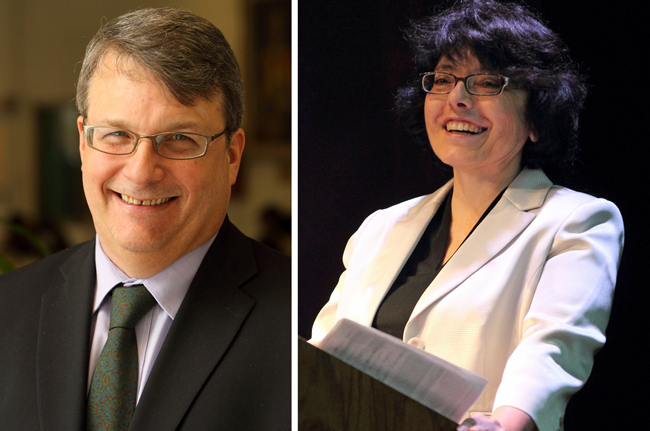 McGill has two new Deans after the Board of Governors on Thursday approved the appointments of Prof. R. Bruce Lennox as Dean of the Faculty of Science, and Prof. Josephine Nalbantoglu as Dean of Graduate and Postdoctoral Studies. Both will take up their positions on July 1 for five-year terms. Lennox replaces outgoing Dean of Science Martin Grant, while Nalbantoglu takes over in GPS from Martin Kreiswirth. Lennox, who is currently Tomlinson Professor of Chemistry, joined the McGill faculty in 1987. He has served as Chair of Chemistry and has just completed a year-long term as President of the McGill Association of University Teachers (MAUT). Since 2009, Nalbantoglu has served as the Director of the Integrated Program in Neuroscience, which is not only McGill’s largest graduate program, but Canada’s largest graduate neuroscience program, with more than 350 students and 190 supervisors. She is a member of the Department of Neurology and Neurosurgery with affiliations to the Montreal Neurological Institute (the Neuro). A McGill graduate, Nalbantoglu earned her PhD in Biochemistry from McGill in 1984 and returned as a faculty member in 1990 after pursuing research in Montreal, London and Saitama, Japan. The major focus of her laboratory at the Neuro has been the study of normal and aberrant gene expression in the nervous system. Prof. Nalbantoglu’s team is working to understand the molecular basis of neuropathology as observed in neurodegenerative diseases, as well as to develop therapeutic approaches for muscular dystrophy and brain tumours. A Fellow of the Royal Society of Canada, Royal Society of Chemistry (UK), and the Chemical Institute of Canada, Lennox led the renewal of laboratory teaching in the Department of Chemistry and has long been a proponent of increased interdisciplinarity, Masi said in a message to the McGill community. He has also made a point of providing undergraduates with opportunities to experience research at the laboratory level. Lennox, who is passionate about teaching and learning innovations, particularly at the undergraduate level, is a past winner of the Faculty of Science’s Leo Yaffe Award for Excellence in Teaching. Prof. Lennox’s research program focuses on the design and synthesis of nanomaterials, with applications in biophysical devices, “smart” nanocomposites, and biosensors. This research has led to a number of collaborations with biochemists, neuroscientists, pharmacologists, microbiologists, cell biologists, chemical and electrical engineers, and physicists. His research group has been supported by more than $5 million in grants awarded by NSERC, FCAR/FRQNT, CIHR, and CFI, while the various roles he played in a number of research consortia helped bring more than $60 million in funding support to McGill. This latter amount includes funding for research facilities, major instrumentation and the Canada Excellence Research Chair. In all, Prof. Lennox’s research program has produced more than 130 peer-reviewed publications. At its April meeting, the Board approved the appointments of Isabelle Bajeux-Besnainou, a Professor in Finance at George Washington University, as the new Dean of the Desautels Faculty of Management and Anja Geitmann, a cell biologist and a Professor in the Department of Biological Sciences at the Université de Montréal, as Dean of Agricultural and Environmental Sciences and Associate Vice-Principal (Macdonald Campus). A search committee is being struck to find appropriate candidates for the next Dean of the Faculty of Arts, after former Dean Christopher Manfredi was appointed to replace Anthony C. Masi as Provost. Prof. Hudson Meadwell has been named Interim Dean of Arts.